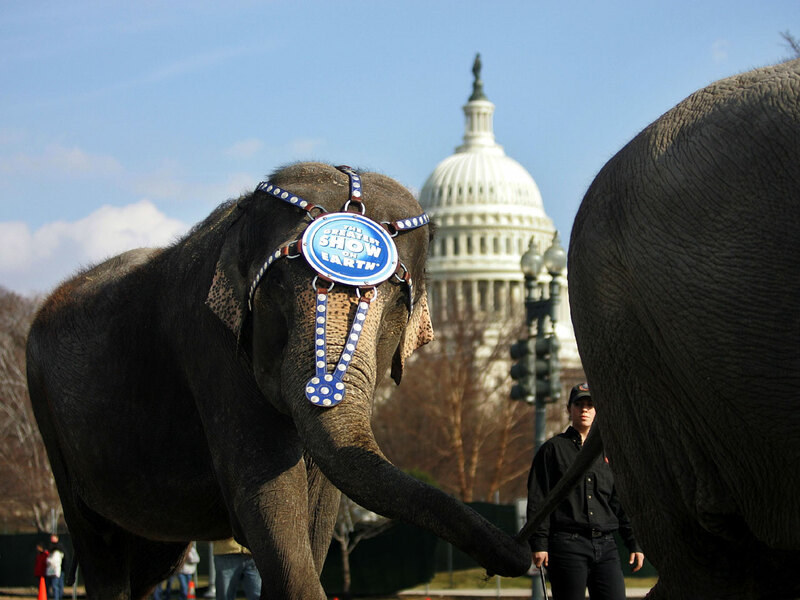 VIENNA, Virginia - The owner of the Ringling Bros. circus has agreed to pay a $270,000 fine to settle allegations that it violated federal animal-welfare laws in its handling of elephants, tigers, zebras and other exotic animals. The U.S. Department of Agriculture says the civil penalty announced Monday is the largest ever assessed against an animal exhibitor under the Animal Welfare Act. Vienna-based Feld Entertainment, which owns the circus and other well-known acts such as Disney on Ice, said it does not admit to violating the law and agreed to the settlement as a cost of doing business to resolve its differences with the USDA. "We look forward to working with the USDA in a cooperative and transparent manner that meets our shared goal of ensuring that our animals are healthy and receive the highest quality care," said a statement released by Kenneth Feld, chief executive officer of Feld Entertainment. In inspection reports from 2007 through this year, inspectors said circus handlers made elephants perform when they were ill and used the same wheelbarrows to feed meat to tigers and haul away their waste, among other allegations. An inspection report from August alleged that a 35-year-old female Asian elephant, Banko, was forced to perform at a show in Los Angeles despite a diagnosis of sand colic and observations that she appeared to be suffering abdominal discomfort. Circus officials told the inspectors that separating Banko from the performing elephants would have been even more distressing to her. The inspection reports also cited splintered floors and rusted cages used to contain big cats such as tigers, and an incident in March 2008 where two zebras briefly got loose from their enclosure at 1st Mariner Arena in Baltimore. In 2010, another zebra escaped its enclosures in Atlanta and had to be captured by area law enforcement, according to the reports. Feld spokesman Steve Payne said that, generally, the circus has seen an increase in recent years in inspections not only by the USDA but also by state and local regulators. He said that from June to September, one of the circus' traveling units was inspected 82 times by 18 different agencies. "We're highly regulated. We accept that regulation. We embrace it," Payne said. Norfolk-based People for the Ethical Treatment of Animals, which has filed numerous complaints with USDA against the circus, especially for its handling of elephants, said the fine is a good first step. But it called on the government to confiscate the elephants. "What remains to be done is for the public to be made aware of this history of abuse so that people will know to keep their children away from the circus," PETA said. As part of the settlement, Ringling also agreed to hire a compliance officer who will ensure that all employees follow the rules outlined in the Animal Welfare Act. All employees who handle animals will also have to undergo compliance training.